Here is something really cool! 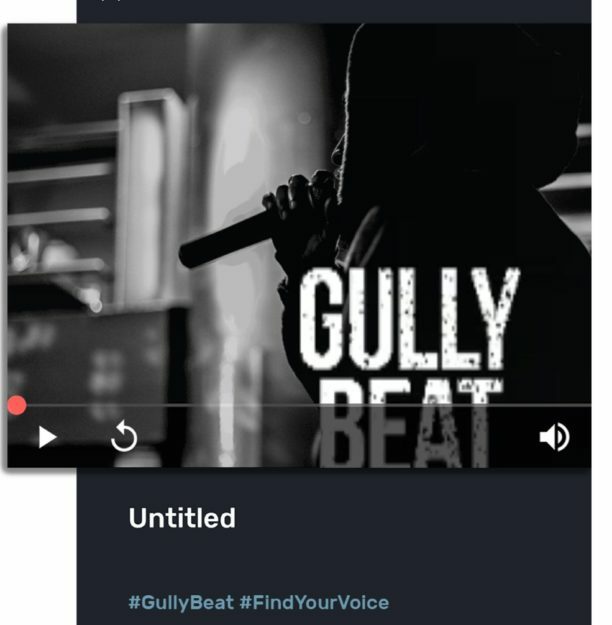 The filmmakers of the eagerly anticipated new film Gully Boy have launched their official pioneering app Gully Beat, aimed at turning anyone into a Gully rap superstar. Marking the first time that an Indian film has launched a dedicated tie-in music app, Gully Beat lets fans compose, record and share their own tracks, bringing them into the world of ‘Gully Rap’. ​Gully Boy tells the story of a gifted street rapper (played by Ranveer Singh) who becomes the face of Mumbai’s underground rap music scene and is inspired by the real-life hip-hop scene in Mumbai slums. The ground-breaking new app launches at a pivotal moment for rap music in India, as artists increasingly gain recognition internationally and the new film Gully Boy propels the Mumbai rap scene to the big screen. The Gully Beat app lets users embark on their own Gully Boy tale, composing tracks in less than a minute. Users are invited to choose their own rap name upon creating an account and are able to immediately start recording their own rap tracks with a selection of high-quality beats to choose from. In addition to creating an original song with the beats available, users are also able to sing along to their favourite songs with the app’s Karaoke Booth, which features all of the songs from the film together in one place. Users can share their own original compositions​ with ​their friends on Facebook, Twitter and other social media platforms. Users can also listen to fiery raps and artists from the same gully (streets).​ As rappers become accustomed with the app they can send in their rap creations ​for the opportunity to feature on the Gully Beat app. The Gully Beat app is perfect for those inspired by the Gully Boy film who want to take their rapping skills to the next level. Whether rap is a passion in life or just a hobby, Gully Beat has something for everyone, and is ​the must-have app for Rap. Be the next voice of the streets! Download the GullyBeat app and express yourself on a beat. You can rap! Record your verse now! Gully Boy is in cinemas on 14th February 2019.